Promotional pineapple lip shimmer w/white tube cap is a luxurious lip treatment, which protects your lips and cosmetically improves them. This lip balm enriches the texture of the lips with its luscious touch and makes your lips appear happy-going and go-lucky. This fresh and pineapple flavored lip shimmer makes a very eligible lip treatment in all seasons. Health Quotient – FDA approved. PABA free. Pineapple flavor. No harsh bleaches, taste enhancers, colors, flavors or fillers added. Cruelty free. Hypoallergenic. 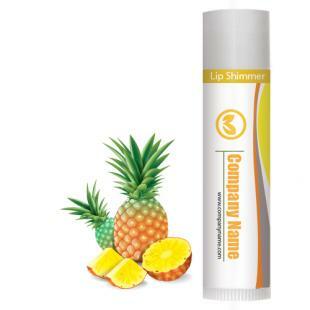 Directions – Apply pineapple lip shimmer evenly over bare lips. Rub it generously for gaining desired texture. Use it regularly to avoid lip irritations and healing cracks. Avoid using it over eyes. Gifting Favors – The promotional pineapple lip shimmer w/white tube cap makes a great gifting choice for marketers in healthcare, food, cosmetics and hospitality related niches. This lip balm makes a great add-on gift or a juicy party gift in all seasons.